Inder Loves Folk Art: Essential tools for the post-apocalyptic pioneer woman. Essential tools for the post-apocalyptic pioneer woman. Now, obviously, I'm taking the predictions of impending end-times, food shortages, and bare grocery shelves with a grain of salt, but I have to say, I love the idea of taking control of my own food supply. I love the idea of growing open-pollinated, non-hybrid varieties of vegetables, and gathering seeds for next year's crops (not that I have done this, but I love the idea of doing this). The best part about Survival Seeds is that, according to this website, you can actually bury these seeds in their waterproof "seed bank" for up to twenty years, and they will still germinate!! If this is true, it is so cool. Is it $149 worth of cool? Maybe not, but it's cool. And if all hell does break loose, why not grow your own veggies? I hear land will be pretty plentiful post-apocalypse. 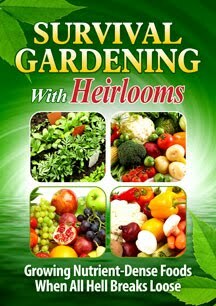 Look for me in a vacant lot, where I will be growing heirloom tomatoes and - sure, why not? - some "Rossa Bianca" eggplants. Can you think of a better end-time activity? Victory Gardens? Survival Gardens? Crisis Gardens? ... Fun! Sign me up! But does vegetable gardening always have to be motivated by the end of the world as we know it? I guess it is nice to feel that your gardening is very important, and could help win a war, save the human race, or help your family survive until the second coming. Otherwise it could easily be confused with just playing in the dirt. So maybe just get started on it now. Because you never know when you might need some delicious home-grown vegetables. I saw this featured on the Colbert Report a while back! Apparently they advertise on Glenn Beck's show. "When you're tilling the earth with a human femur while the sky is raining fire, you'll want a reliable supply of radicchio and mini squash." Dude, that is SO MUCH FUNNIER than me. Love it. I love this! I really really love it. Thanks for finding it, joking about it, and sharing it.